I have been neglectful about completing the blog posts for these final transformations of our Mariner Orient 38. We chose to use and enjoy the boat during our beautiful New England summer. Enjoying it also gave us the opportunity to test all of these renovations before our next big “going south” adventure. The “master stateroom” (sounds like a mega yacht, doesn’t it?) 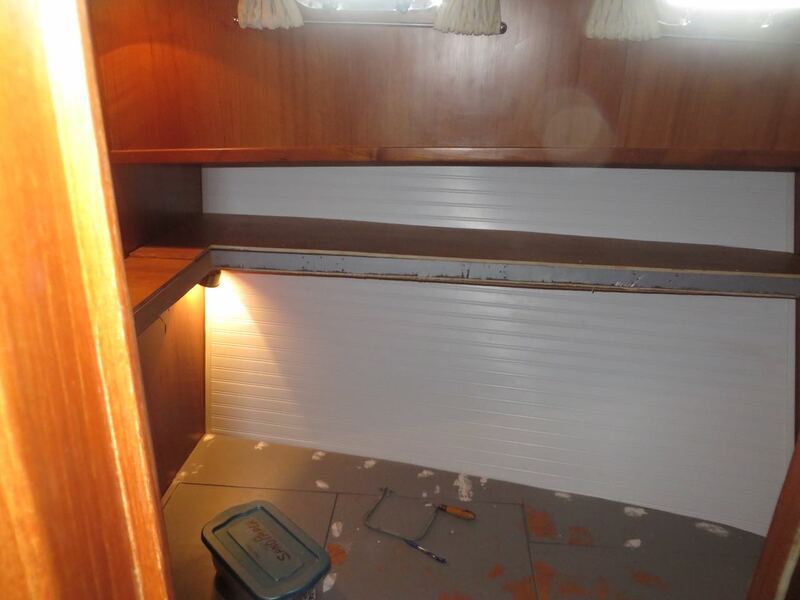 did not need as much work as the other areas of the boat. It needed brightening and decorating to suit our style. 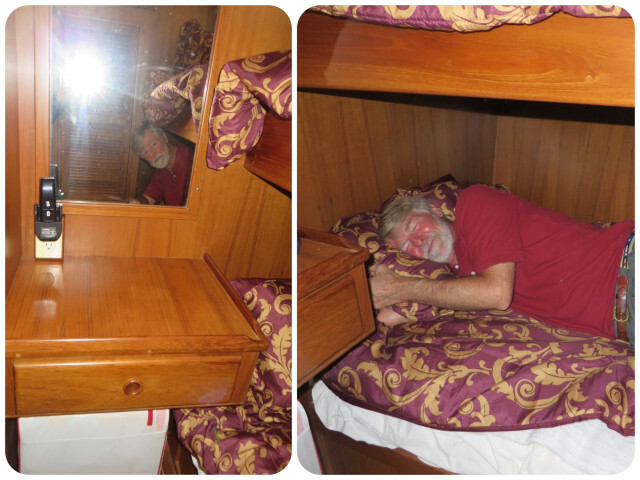 Photos of the master cabin during our first tour of the Mariner Orient. Everything is in good condition, but very basic, without enough storage or style. The mattress was in excellent shape (this boat had not seen much use in its first 11 years), but it needed a new topper. Al cut memory foam to fit the contours of the bed. An electric kitchen knife easily cuts through the foam. Adding on the mattress pad and making the bed. He does a fine job even if he is rather tall to fit there. It is a very comfortable bed! 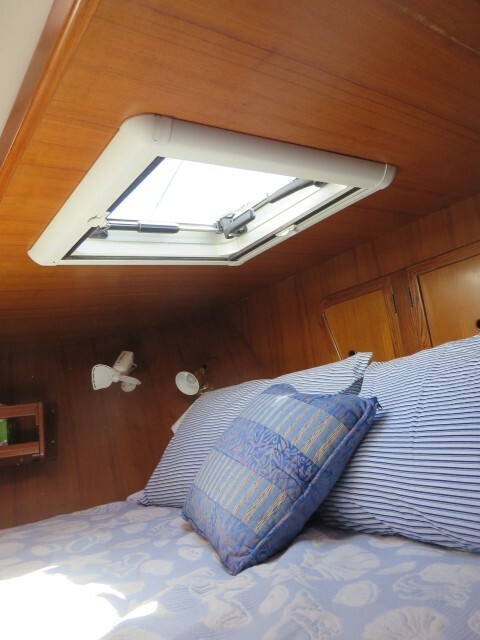 You can see from the old photos that the head of the bed is actually under the front deck on the bow, which can be somewhat claustrophobic. Al decided to fix that with a new hatch. Now we can look at the stars at night over our heads, close it so the sun doesn’t wake us in the morning, and get fresh air. Love it!! 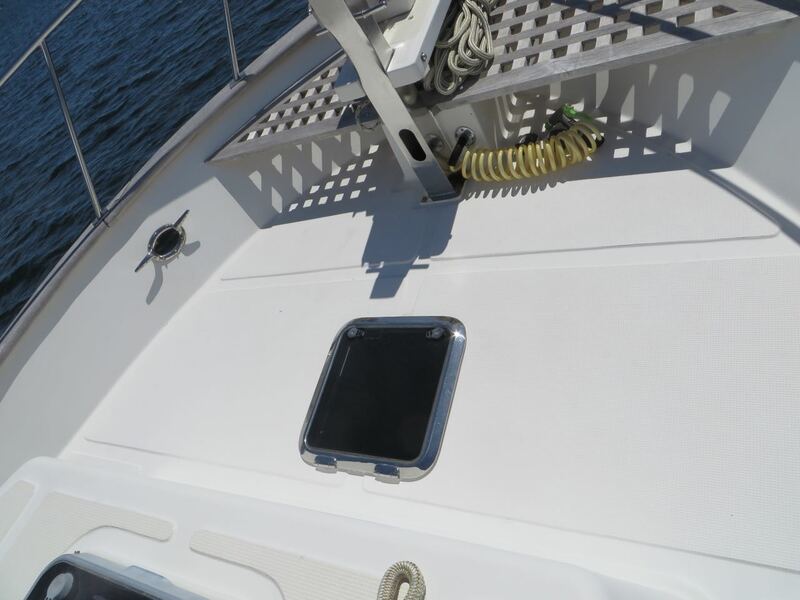 outside view of the new hatch on the bow, just behind the anchor windlass and teak grid. The new hatch from the inside. What a difference this made. 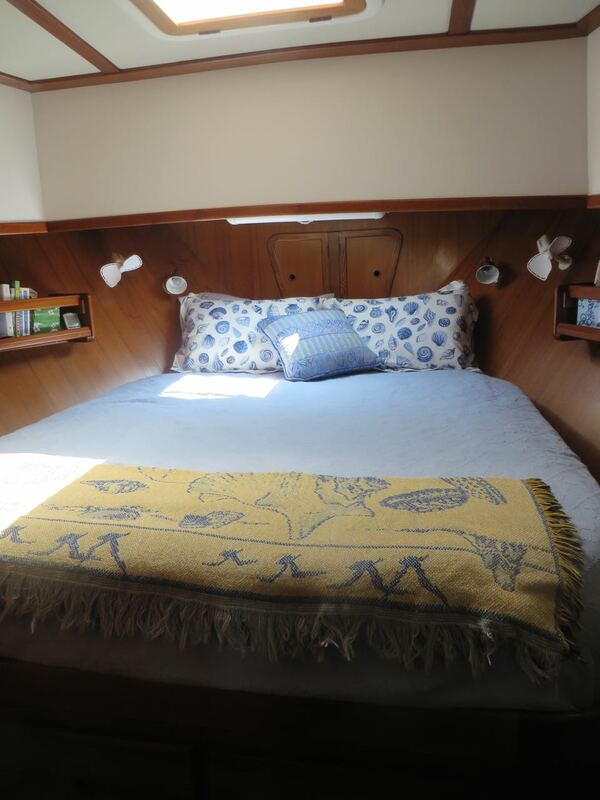 A new solid blue coverlet with pillow shams sewn from shell fabric I had once bought for a previous boat and never used (amazing what you can find in your basement!) A yellow throw adds a bit more color. We noticed that the Grand Banks trawlers were white above the bed instead of all wood and decided to use that idea for brightening the cabin. The cabin is so much more cheerful now. Our intention is to hang artwork up there, but we have not found anything yet. It has to be just right. The shelves along each side of the bed were nice and long, but what do you put there that won’t look messy?? I found these canvas baskets that can be pushed into place and pulled out much more easily than woven baskets. Four for each side, his and hers. We will be able to store a lot of smaller clothing and accessories in these. The canvas baskets on the shelves can be used for all sorts of items. 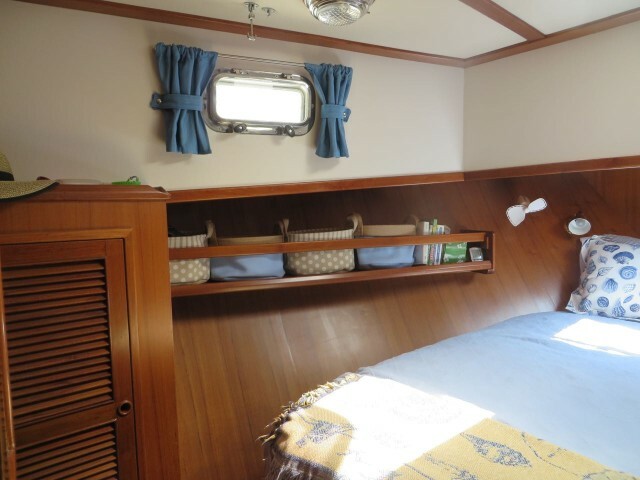 The new porthole curtains were sewn from extra fabric leftover from the salon cushions. Hanging storage behind the door. I also bought a hanging door thing in the hope that small items might fit in the assorted pockets. (Is there a name for these now? They once held only shoes, but these new ones have pockets with a variety of sizes.) Have to wait and see how useful this turns out to be. The guest cabin received the biggest makeover. The second cabin on a boat, sail or power, often becomes another storage area. A family naturally has to use it as a real bedroom, but a couple can take advantage of the space for more storage because you can never have too much storage. Ideally, the second cabin can serve both purposes – extra storage and occasional use for guests. 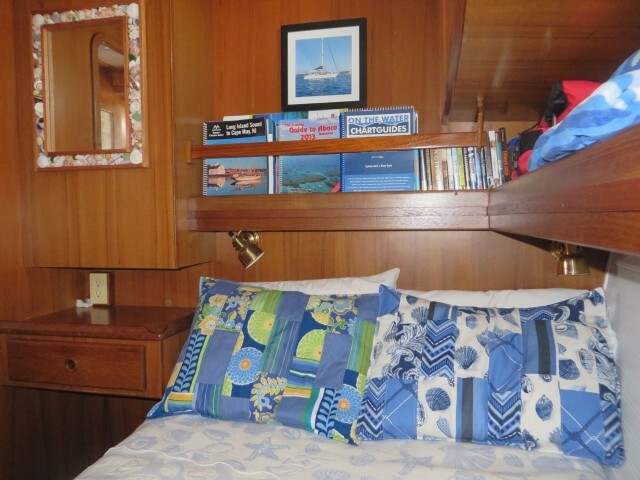 The Mariner Orient 38’s guest cabin usually has bunk beds. That might be perfect for some folks, especially families with children, but it wasn’t going to work for us. 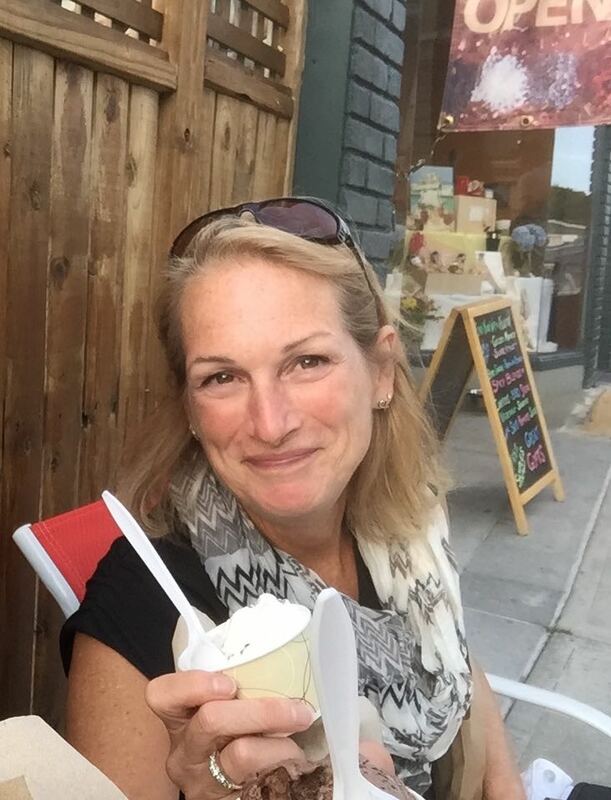 Our first look at “Unfunded Requirement” (I still cringe when I hear that name.) The cabin seemed like a dark hole with that upper bunk blocking the light. The first step for Al was another R&R, “rip and restore”, project. The top bunk came out. 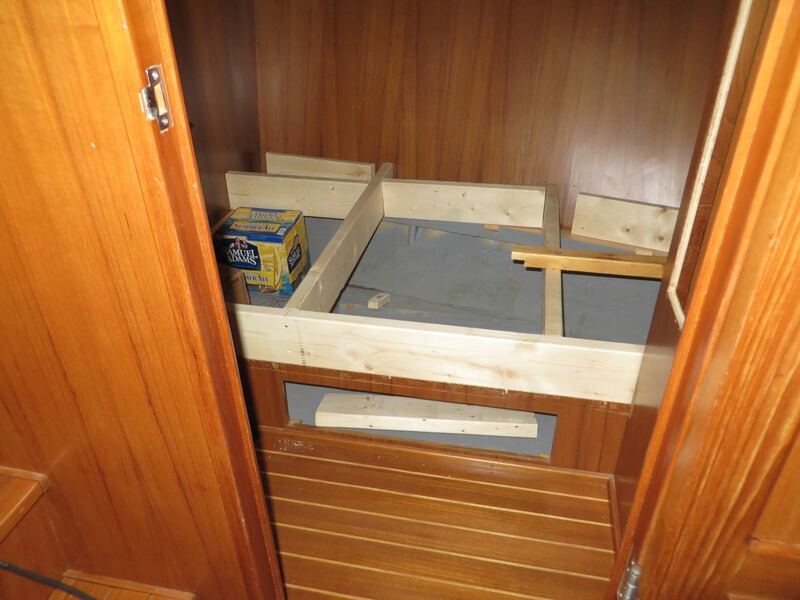 Upper bunk has been partially cut out – see the aluminum beams that strengthened the bunk? What’s left will support future shelving. Next step was to raise that lower bunk up, gaining both more storage space underneath and a wider, more comfortable bed. A wall of white bead board helped to brighten the woody interior of the cabin. We saw that on a Grand Banks and thought it really made a difference. Why not incorporate it into our guest cabin? 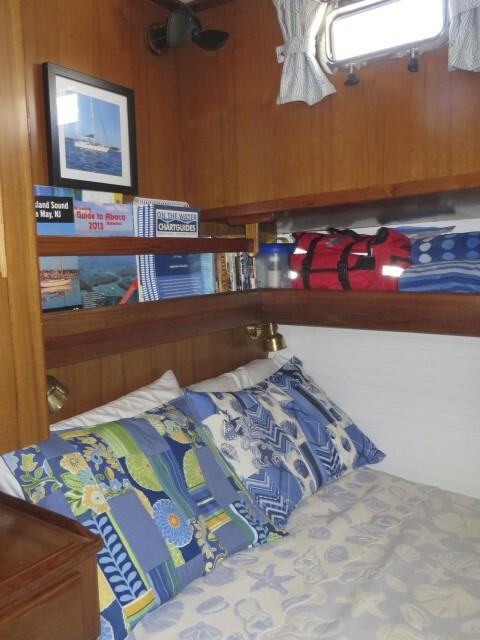 Another Grand Banks idea – brighten the cabin with white head board. You can see the “shelf surround” taking shape. I used leftover yardage from the salon curtains to make new porthole curtains. We removed the bottom horizontal bar and allowed the curtains to hang free. That actually makes it much easier to close them when needed and did not affect the way they hang. The remains of the old upper bunk became a stylish shelf that runs over the head of the bunk and along the side. 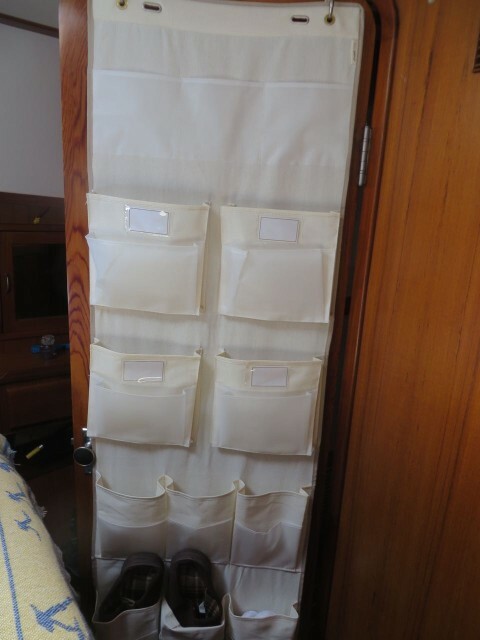 An extra bar allows charts, books and dvds to be stored there. The shelf holds first aid supplies, and any other items we need to stow. Our custom mirror, a combined effort created over the long cold, snowy, winter, now hangs on the backside of the pantry. The coverlet is a sentimental piece to us. 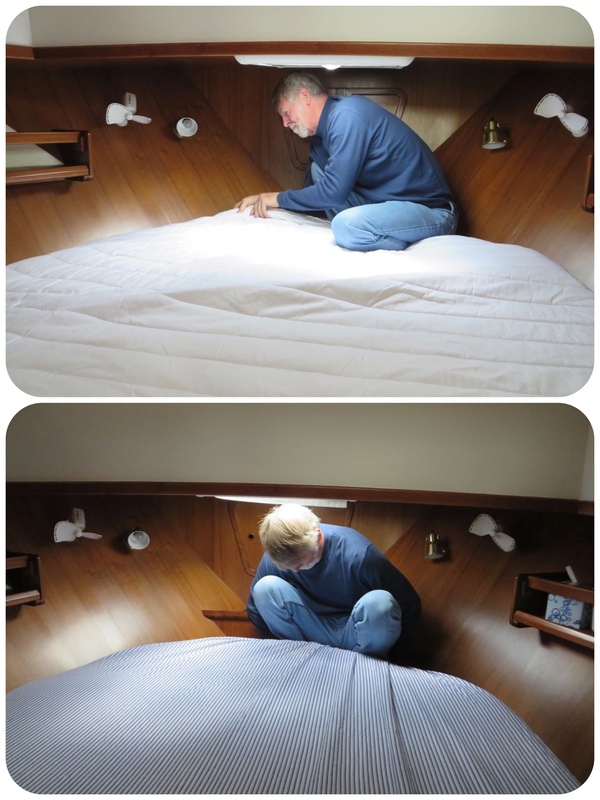 I found it for our Catalina 34, used it again on the Morgan 43, and now it covers this bunk on the Mariner Orient. Speaking of the bunk, it has a new mattress thanks to IKEA and Al’s talent for cutting foam to fit unusual shapes. Our cabin is ready for guests – come visit us! On a boat, the bathroom is called the head. You may well wonder why this room is called “the head.” I certainly did. I have used the nautical term for many years but really did not know the origin. I’ll share my new knowledge with you: Historically, the toilet was located on the sailing vessel’s bow, the “head” of the boat, for two reasons. First, most ships could not sail directly into the wind, which meant that the wind would come more from the rear of the ship, placing the head downwind. A plus for obvious reasons. Secondly, if the head was above the water line with vents cut near the floor level, the normal wave action coming over the bow would flush out the “facility.” Another plus. Fortunately, for all of us modern sailors, our heads are more comfortable, more attractive, and better smelling, if maintained well. 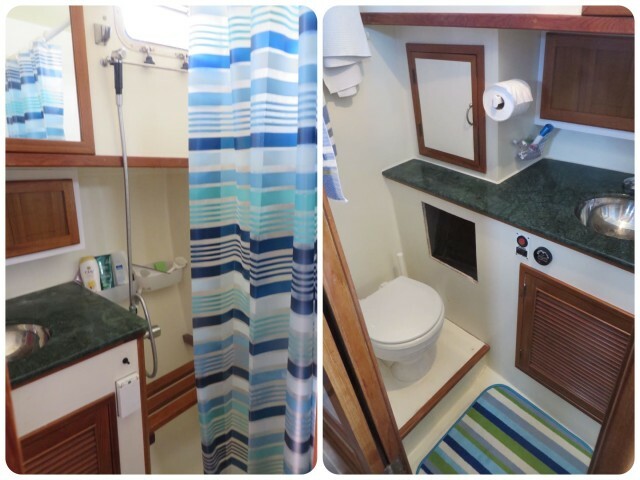 Even so, the bathroom on a boat (I’m not talking about expensive yachts here) is never as large as the one you have in your home, even a small home. And the water is never as hot as often as you want, nor is the water as plentiful. But, you can have a reasonably nice shower to clean off the day’s sunscreen and grime.That’s a priority for me – no shower, no go. 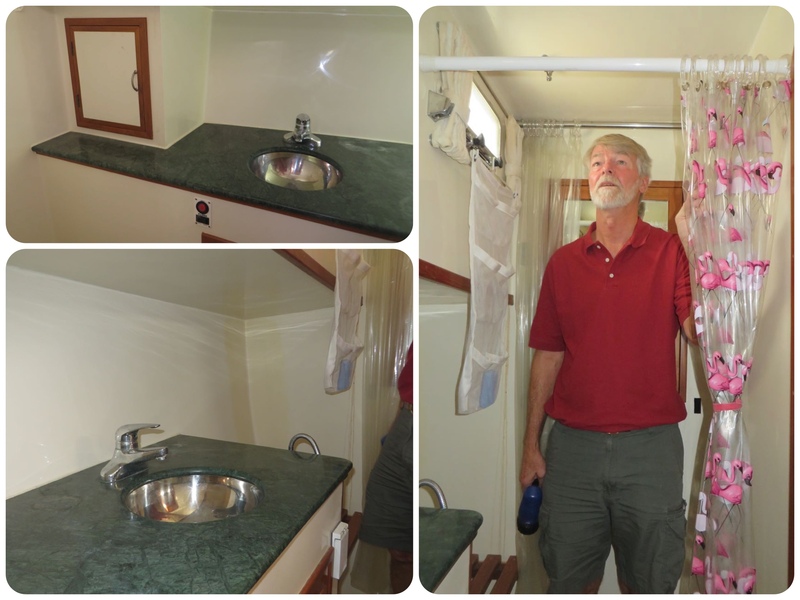 The best thing about this head was the separate shower stall and its height. Look! Al can actually stand in it. Here again, it was all about the storage. What is it with boat designers??? Do they not see the potential for usable space?? Notice in the pictures above that there was lots of space behind the sink. Lots of empty space. 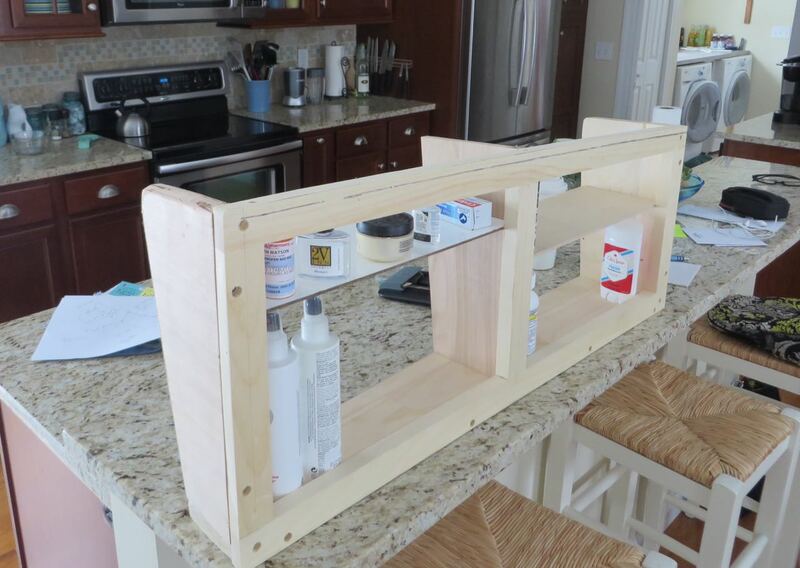 Al designed a toiletries cabinet that would fit there, customizing for the peculiar angles and dimensions. The new toiletries cabinet in the planning and design stage (sitting on our kitchen countertop). There was a nice little storage cupboard to the left of the sink with two shelves (hallelujah! ), but below that, under the counter, there was more empty space. Al and his sawzall to the rescue! 1st – Mark out the cut. Don’t forget to measure twice, cut once. 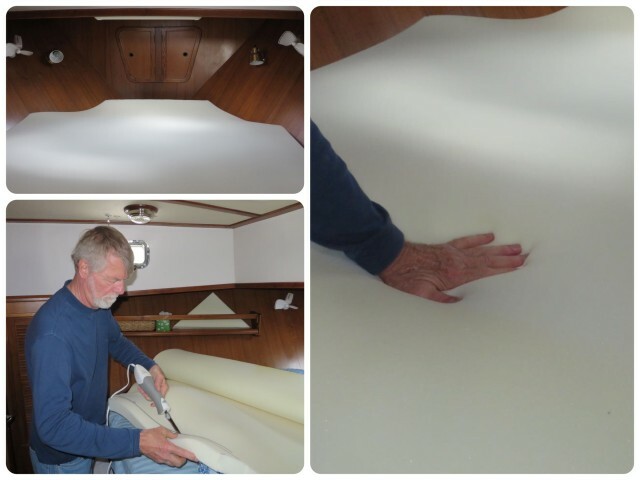 2nd – Cut through the fiberglass with the sawzall. 3rd – Take picture of the dust you made so that Michele knows you had a lot to clean up before she saw your finished efforts. 4th – Admire the new-found storage space. It’s going to hold the extra toilet paper, paper towels…. Push button flush??? That’s an upgrade from the old pump toilets. This toilet is fancier than our sailboats. 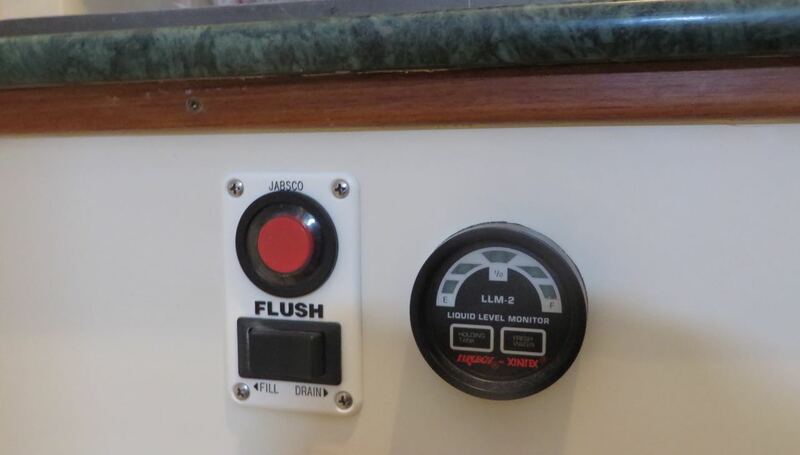 Instead of pumping a handle to flush, you push the little red button. I guess it is an improvement, but I worry about the chance that something will go wrong and break. The more complicated it is, the harder it is to repair. Al added a holding tank gauge so we can monitor … the holding tank. I think you can imagine what that holds and why it needs to be monitored. Pump out time! Finished Head! Had to change out the flamingo shower curtain to a blue stripe. Added Command bath shelves in the back of the shower. You can also see the finished wood doors on the toiletries cabinet behind the sink. Silly me, I forgot to take a final photo with the nice hatch door on the new storage hole. 🙁 This will have to do. 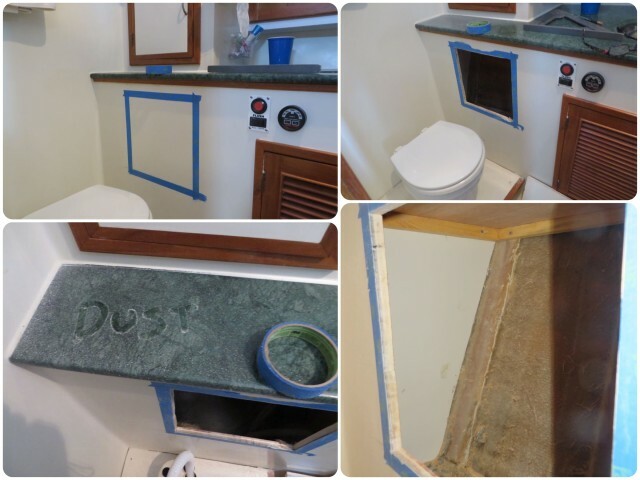 Television – not “below deck”, but worth sharing. 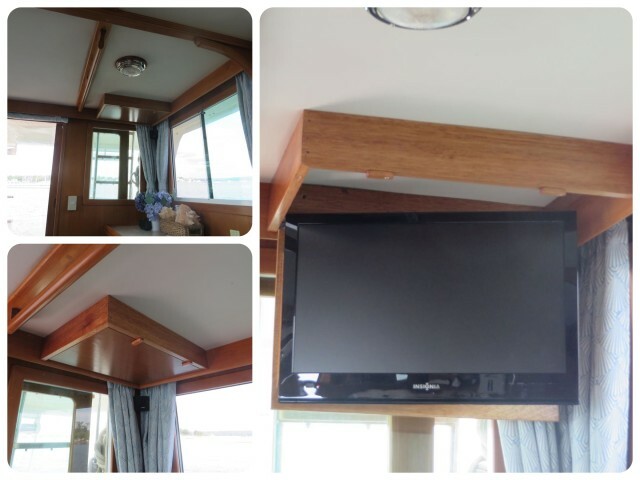 Another “improvement” was just added in the salon, if you consider adding a television to be an improvement to cruising. You can’t always get reception, but if you can, it is nice to catch some news and weather. 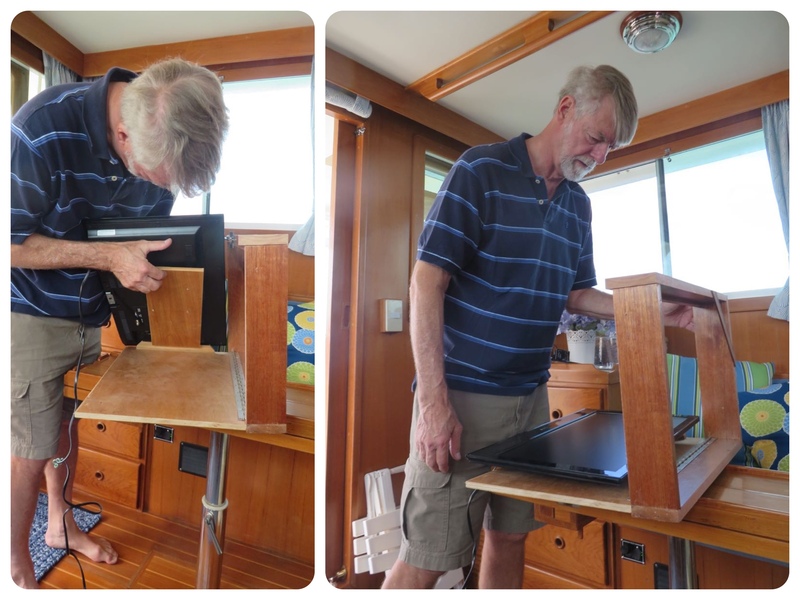 We don’t watch tv very often on the boat, but this one was the right size and free, thanks to a family member who no longer needed it. I didn’t want a tv to take up valuable real estate in the salon, so Al created a storage cabinet in the ceiling. Add an inexpensive dvd player and we can watch some favorite movies on those rainy evenings or days. The finished television in its out-of-the-way location. Perfect! Do I need a popcorn maker now? The major renovations have been completed. 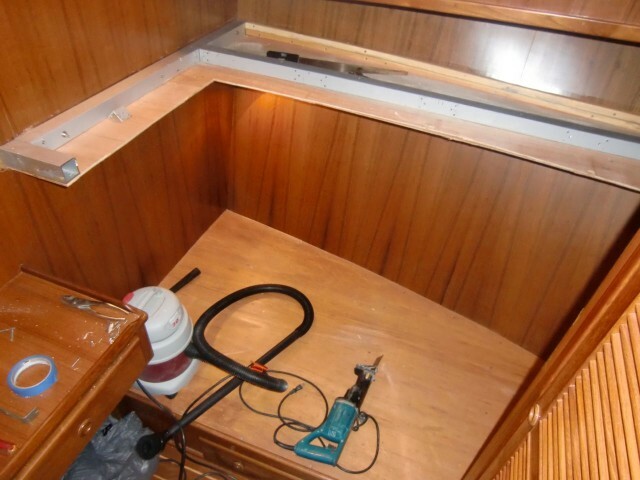 Al has managed to transform another boat in record time – 12 months instead of 12 years. It was worth staying home this year so that we could both work part-time and get this boat ready. I think she is going to be a very comfortable place to spend 8 months. Only two and a half weeks left to finish the preparations for another cruising adventure —aye yai yai! That seems like a curious title for a blog, but that is exactly what this week was. 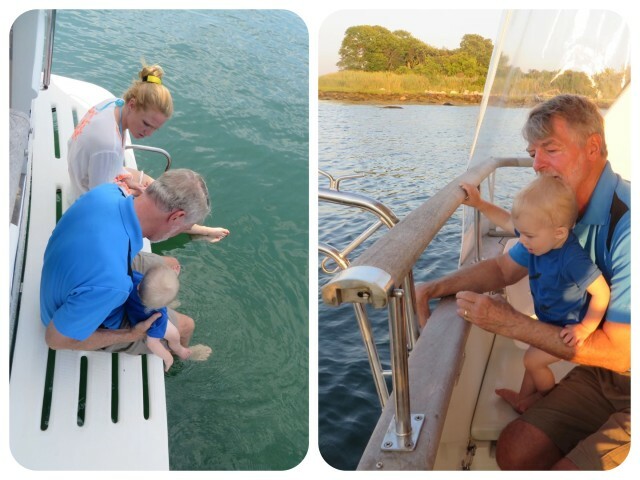 We introduced our youngest grandchild to the boat, and we celebrated 21 years of marriage. 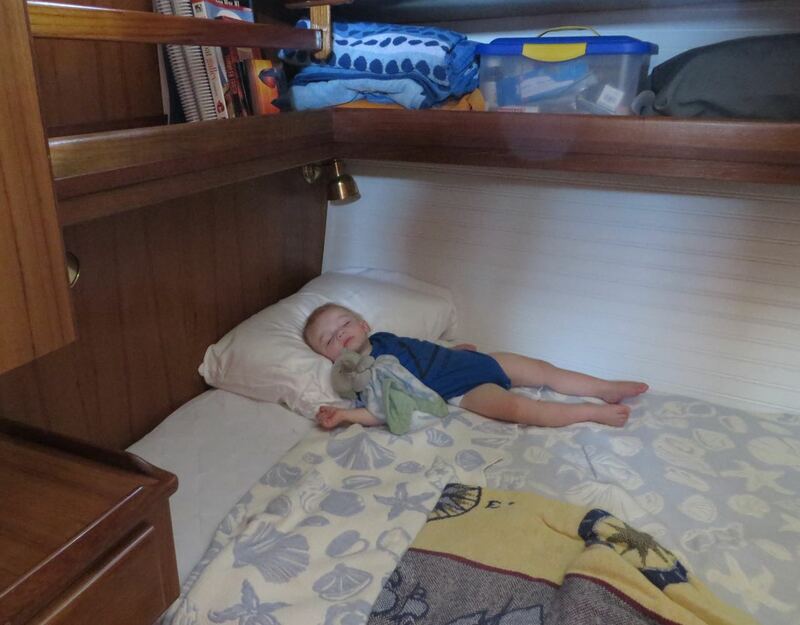 Aaron, now 5, and Ella, now 2, have both been on the Morgan sailboat and the Mariner Orient. They leave near Chesapeake City on the Chesapeake and Delaware Canal and visited us on our way south on the Morgan in 2013, and on our way north with the Mariner one year ago. 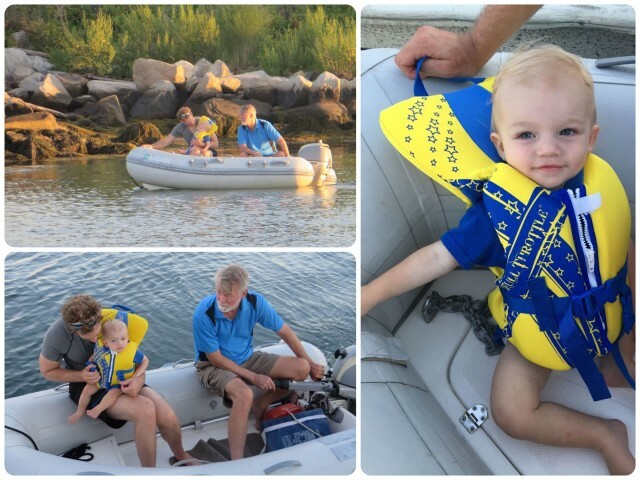 Caleb is our youngest grandchild and the first to be aboard the boat while underway. 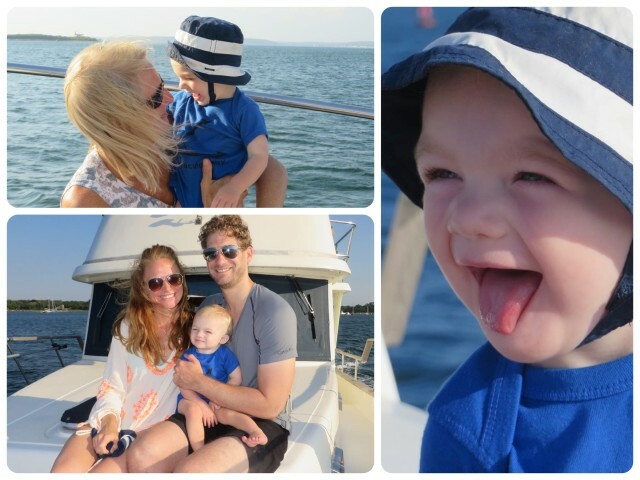 He came with his parents, Ryan and Kerri, to visit and spend the day on the boat. 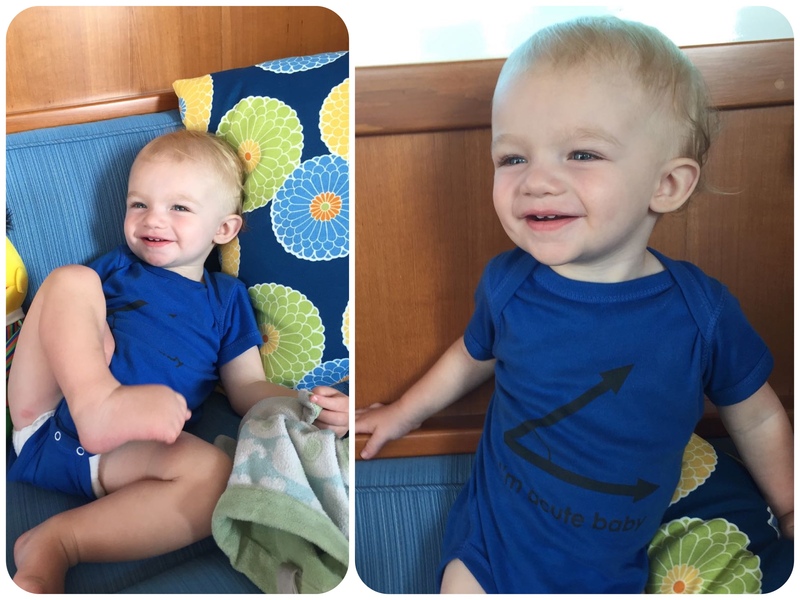 Relaxing in the salon – If any of my math cohorts are reading this – notice the the onesies “I’m acute baby”. Believe it or not, it wasn’t a gift from Nana! 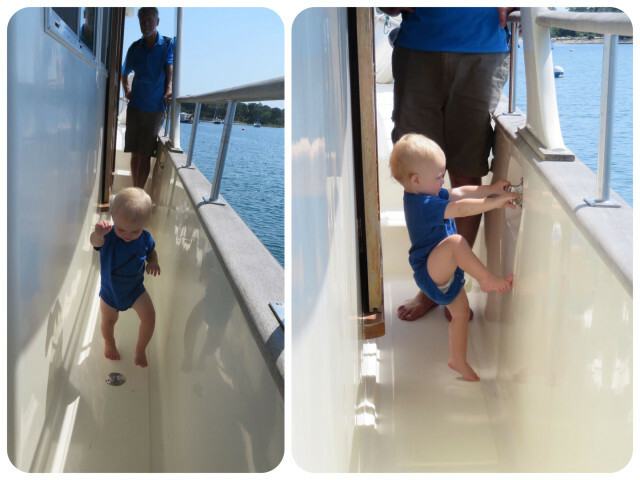 Caleb getting his sea legs. 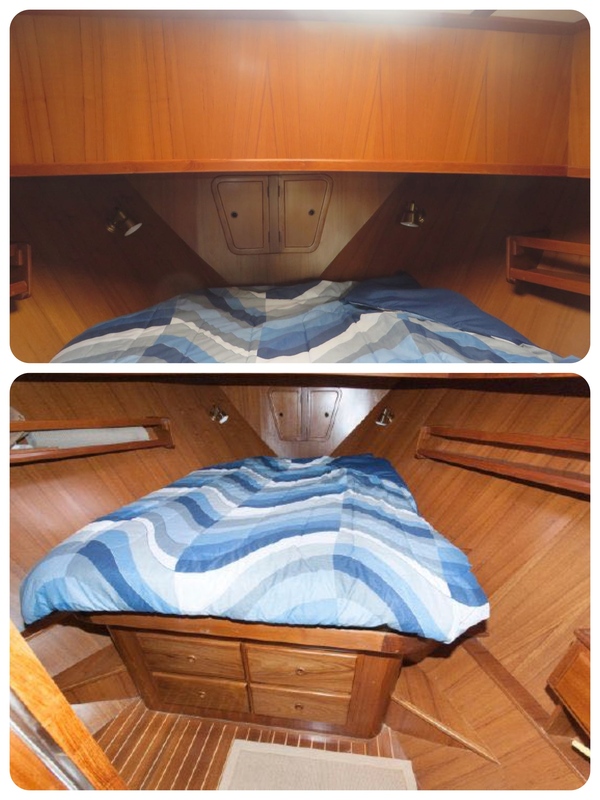 This trawler is incredibly safe for a little one with its high surround on the side decks and enclosed aft cockpit. Checking out the swim platform and aft deck with Mommy and Papa. 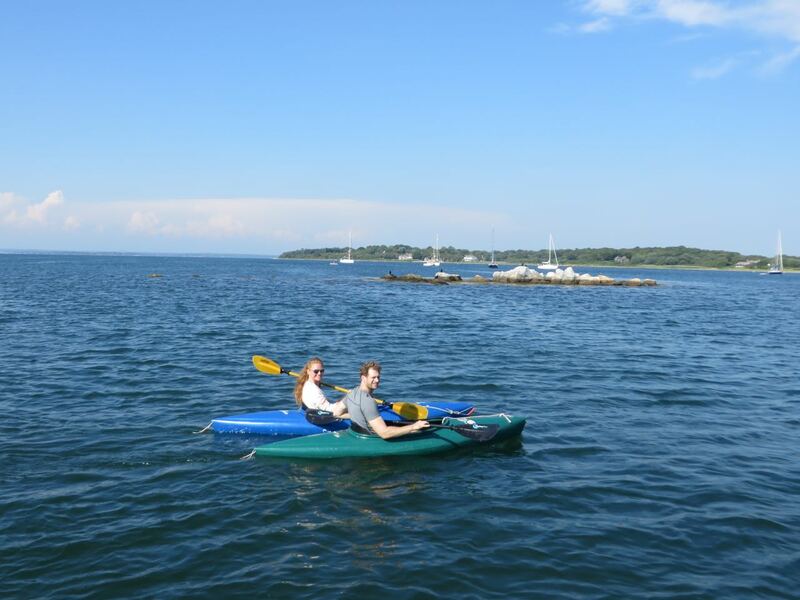 Mommy and Daddy go kayaking around West Harbor. All that sea air and water just tuckers a little guy out. Nap time! We said our goodbyes to the “kids” and left the next day for a little getaway. With only 2 days, we decided to try the tiny anchorage behind Ram Island, a small private island at the mouth of the Mystic River. 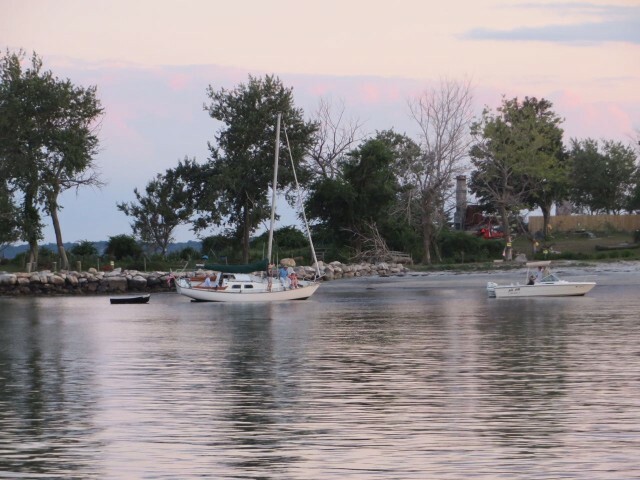 Wikipedia informed us that the island was once the site of an exclusive Victorian hotel and resort where ships from Boston and New York City stopped twice each day. Abandoned and in disrepair by 1920, it was completely demolished by the Hurricane of 1938. That’s certainly not surprising when you see how low the island is. 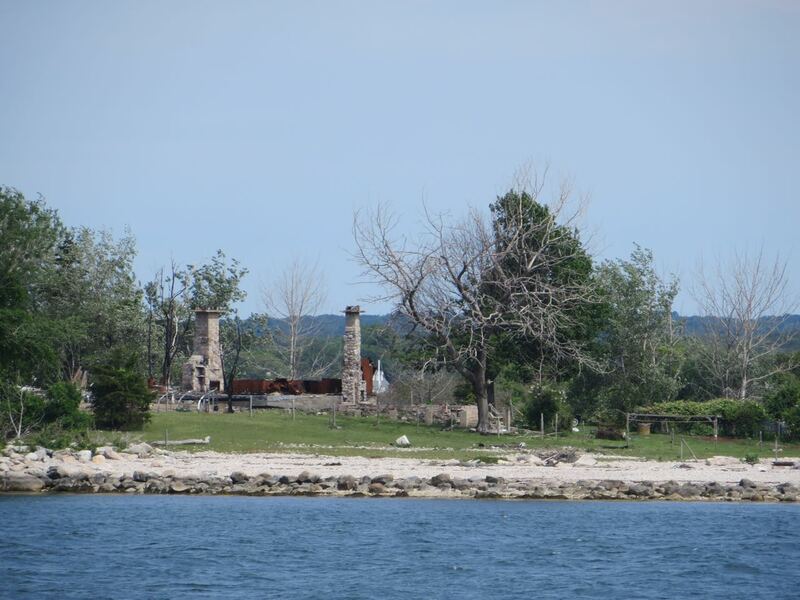 We had noticed when passing the island on our way back and forth to Watch Hill that there must have been a fire sometime in the past couple of years. Chimneys remaining after the fires. 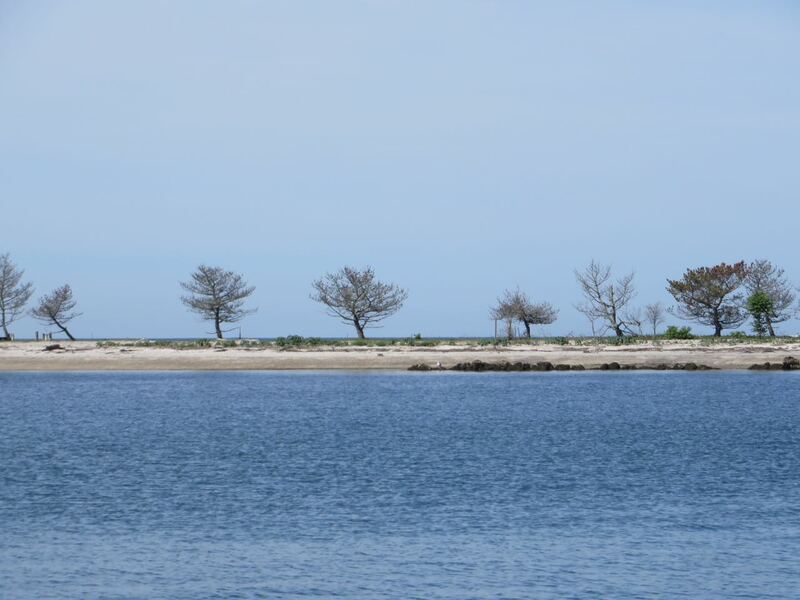 We could see this as we passed by the island on earlier trips. Once again, a little googling tells that us that the barn was destroyed by fire in February 2013 and the residence in March 2014. On this day, there was activity on the island, men and a small backhoe and wood chipper, so it would seem that the structures will be rebuilt. We could hear sheep and saw a few horses grazing. View of the lowest and skinniest part of the island from our anchor spot. I am not sure how there was ever a hotel or resort on this island. Just doesn’t seem big enough. Just not going to move at all until there is more water below that keel! Even with the help of a small power boat, it would not budge. High tide would come in the dark. After all the daytrippers returned to their homeports, we had the anchorage to ourselves. So peaceful and quiet. 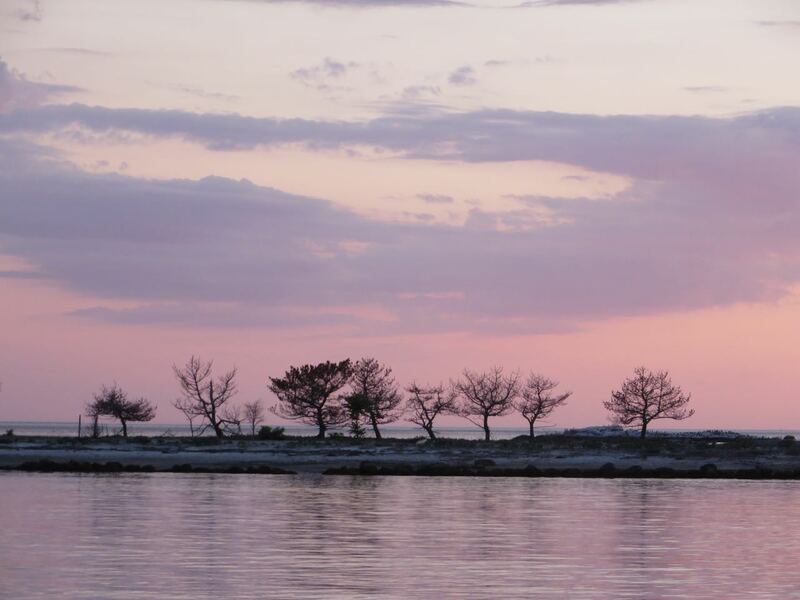 Changing colors on the low lying island. 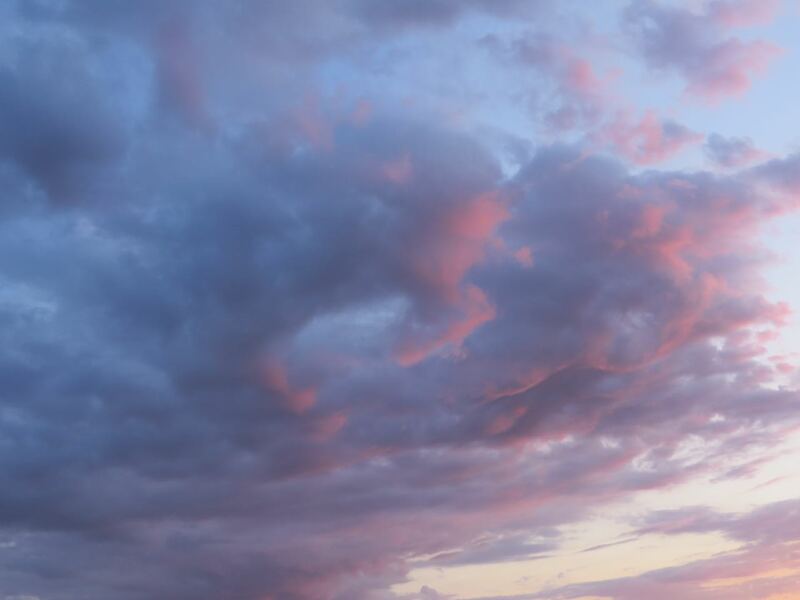 Swirls of pink and blue are echoed in the sky. We awoke to a beautiful morning. A bright sky and cool -just like our wedding day, 21 years ago. 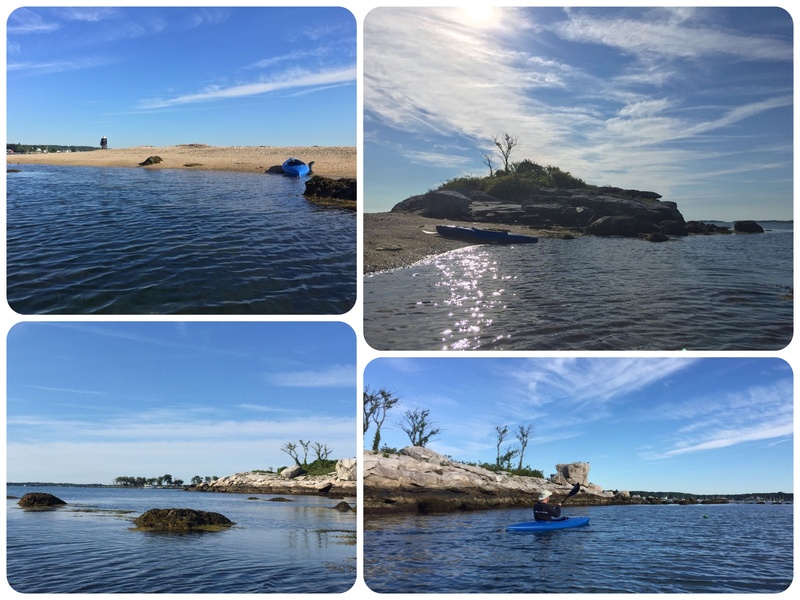 🙂 After brewing our coffee, we went kayaking around Ram Island and over to a few small nearby islands. “Islands” may be an exaggeration. These were more like rocky points that jut up above sea level, with a little sandy beach at low, low tide. 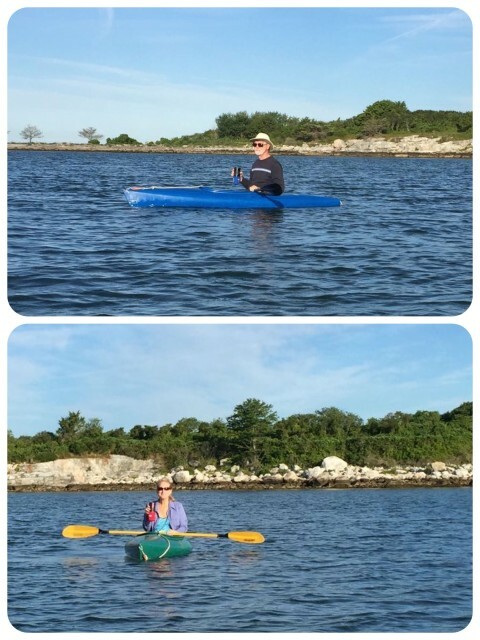 Kayaks and “K”offee – perfect morning. 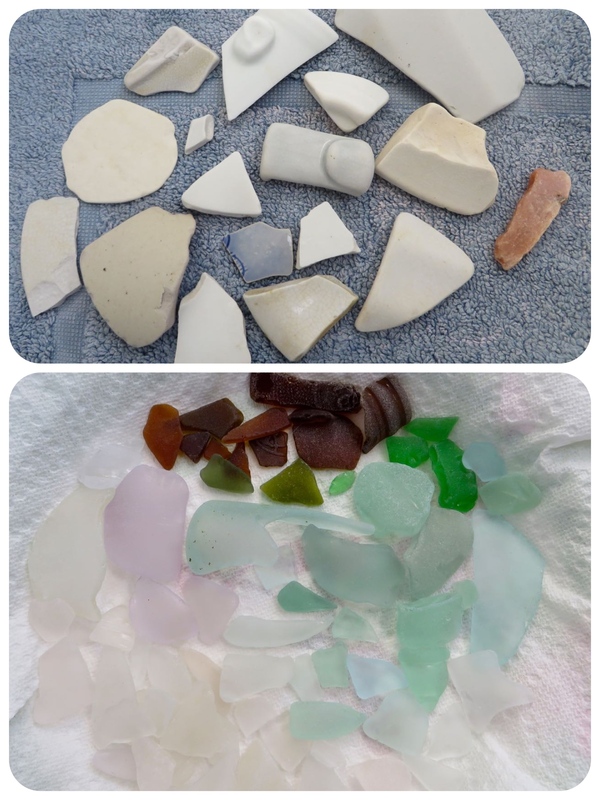 Our anniversary gifts to each other were some very nice beach combing finds of pottery and sea glass. Hoorah! 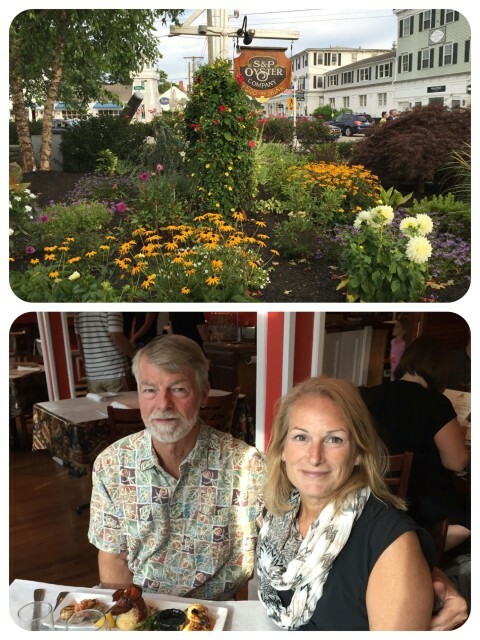 We had a delightful anniversary dinner at S&P Oyster in Mystic, overlooking the river and the drawbridge. Ending with ice cream at Mystic Drawbridge – Lemon Chocolate Kiss, again! A happy week and a happy anniversary. We are a very blessed couple.